A 49 year old business man presents to the clinic describing what he thinks is Shin Splints in his right leg. He has been in tremendous pain for approximately 2 months, and describes walking bare foot and in thongs during a period of 3 months when he was in between jobs. Recently, the pain from his Shin Splints was so severe that he was unable to walk without limping. The pain reached a level that was unbearable and this forced him to visit a GP close to his office who referred him for an injection of cortisone. This gentleman, who we will refer to as Mr X, went along to a local imaging centre and the radiologist used Ultra sound imaging to guide the needle into the affected area. 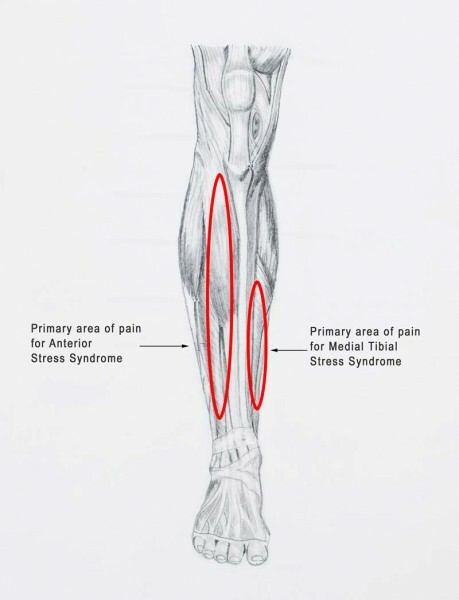 The report from the doctor described tenosynovitis, which is commonly referred to as Shin Splints, but more accurately refers to inflammation within the tendon sheath, of the Tibialis Posterior tendon. Mr X felt instant relief and was extremely happy with the outcome. He was now able to walk pain free. The GP involved quite rightly insisted that Mr X seek the advice and opinion of a Sports Podiatrist in order to ascertain the cause of his Shin Splints and to ensure his condition was managed properly following the injection. If there was a bio mechanical issue, a footwear problem or some form of activity that was affecting the Tibialis Posterior tendon, then he may cause further damage to the area. It’s important to consider the incidence of tendon rupture following the administration of cortisone. There was a small band aid covering the entry point of the needle, over the navicular area which the Podiatrist removed. The injection had been deposited into the insertion of the tendon. Mr X requested an orthotic check up. He presented with a 5 year old pair of plastic orthotics which were not prescribed for Shin Splints back then but for another condition caused by his foot function. The orthotics were firm and half length and fitted nicely into his business shoes. He had re introduced these orthotics recently and found them to be comfortable. They provided some relief of his condition. The Podiatrist asked Mr X to stand barefoot on top of his orthotics which allowed the shape and contact points to be assessed. Mr X was advised that his orthotics, while 5 years old and well worn, were still in good shape and fine to use. He was advised that if he wanted to prevent the return of his Shin Splints he must continue to use the orthotics on a daily basis. These would unload and reduce the stress on the Tibialis Posterior tendon. Standing bare foot, in a relaxed position, it was clear that Mr X had 2 feet with differing architecture. His right foot, the one involved in his acute bout of Shin Splints, had a resting medial arch height of 25mm and pronated dramatically. His calcaneus (heel bone) everted to approximately 12 degrees and the medial aspect of the ankle / sub talar joint protruded. His left arch was 30mm high and heel position 5mm everted. Shin Splints is common in the foot that over pronates and this was explained to Mr X.
Mr X demonstrated a reduced range of ankle joint dorsiflexion due to tightness and stiffness in his calf muscles. This produces an early heel lift during gait and causes the overload of Tibialis Posterior and Peroneal tendons. On palpation, the Peroneal tendons were unremarkable. Mr X was informed that walking for an extended period of time in his bare feet and thongs would have contributed to this calf muscle tightness. Mr X was observed walking and running on a treadmill in his bare feet. His gait was captured using digital software on an iPad. Mr X walked with an externally rotated right foot – The result of external tibial torsion- 22 degrees. His left tibia measured a normal range of 13 degrees. As his right foot was abducted during gait, the pronatory forces would be greater, and this would allow the foot to “roll in”. In slow motion, it was also possible to observe an early heel lift, as suspected. The range of motion in other joints of the foot was unremarkable and there was no tenderness in other muscle groups, aside from a mild awareness in the right arch, on palpation. MR X was wearing excellent business shoes made from quality leather. The sole was firm and durable and demonstrated an even wear pattern. The upper was also quality leather and the shoes had a firm heel counter. His half length orthotics fitted nicely into these shoes and the support was satisfactory. Mr X also had some sports shoes and although these were not present, he advised the Podiatrist that they were a quality shoe from Athletes Foot. He reports that he sometimes inserts his orthotics into the running shoes but he does not feel comfortable. The front edge of the orthotics presses sharply against the bottom of his forefoot. He prefers to wear his running shoes without the orthotics but he is concerned that his Shin Splints might return if he continues in this way. 4: Avoid / reduce walking in bare feet. This patient was asked to return to the clinic after 4 weeks and an improvement in the range of his ankle joint dorsiflexion was noted. He was extremely comfortable in his sports orthotics and enjoyed the slow release poron which provided padding. There had been no return of any pain in the shin of his right leg / foot. He was given a return to running training programme which involved a gradual increase in distance, frequency and intensity of running. He was instructed to reach out to the Podiatrist if his Shin Splints pain returned. Please do not take the information in this case study as general advice. If you have Shin Splints or any other type of running injury you should talk to a qualified Sports Podiatrist or doctor.